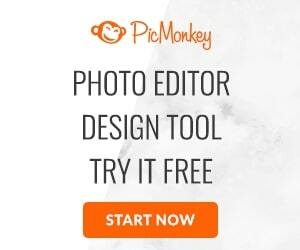 I was not asked to do a review of PicMonkey (I just really love PicMonkey), the post below does contain affiliate links. Using the links in this post helps support this blog at no extra cost to you and is greatly appreciated. I’ve been in a funk this week. I tried several recipes from cookbooks, a few blogs, and my trusty ole Pinterest. Unfortunately, the majority of the recipes were mediocre or epic fails – the kind where at least one of my kids gagged, nobody cleaned their plate, leftovers weren’t eaten, and it ended up being tossed out. That type of fail. I couldn’t even get my craft project right. It was kind of a bummer because I wanted to post a fantastic recipe or fun project to share this weekend, but I guess sometimes that’s just how the cookie crumbles. The only thing I was able to do with any success was my first PB inspired spring printables using PicMonkey‘s photo editing site. If you’ve followed me from the beginning of this blog, you’ll know that I’m not very tech savvy. However, PicMonkey is so easy to use that even I was able to create PB inspired spring printables to share with all of you. The size in the file is 8×10, but you should be able to resize the printable to suit your needs. BTW- Do you like the updated Easter banner and blog? The banner, collages, and my Linky Parties button were all created using PicMonkey ( I do have the Royale version and it’s worth the $33 a year). If you’d like a free day to try the Royale version, click here. Printable hanging next to our calendar. What a cute idea! I too love picmonkey. They have some great things on there! How pretty and colourful. Thanks for linking up to Sweet and Savoury Sunday, stop by and link up again. Happy Easter, have a great weekend! These are so cute and creative! Thanks so much for sharing it with us at Show-licious Craft and Recipe party! 🙂 Pinned.